Codename Cygnus is interactive radio drama: there are voice-acted scenes with music and sound effects. 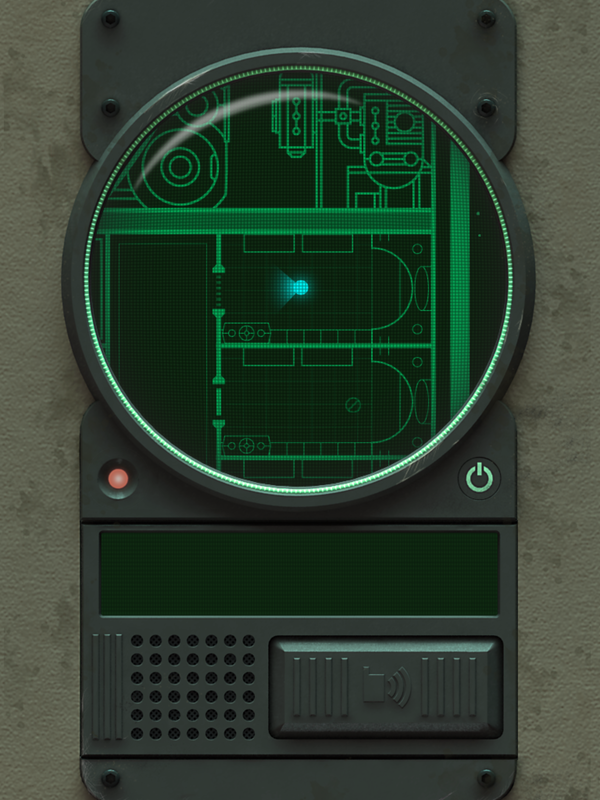 The premise is that you’re a secret agent, and you can download several missions; each mission is itself divided into smallish episodes, so when you start something, you’re not committed to a long session. It’s highly genre-determined, trope-y stuff, where you’re meeting bad guys with foreign accents across a gaming table, or slipping truth serum into someone’s drink. Periodically the narrator asks you which of two options you’d like to pursue in order to continue your mission, with specific keywords for you to speak (“Athletic? Or Clever?”). You can either speak the next word or tap the option on-screen, but the system is designed so that you can play entirely hands-free, without holding or looking at your device. 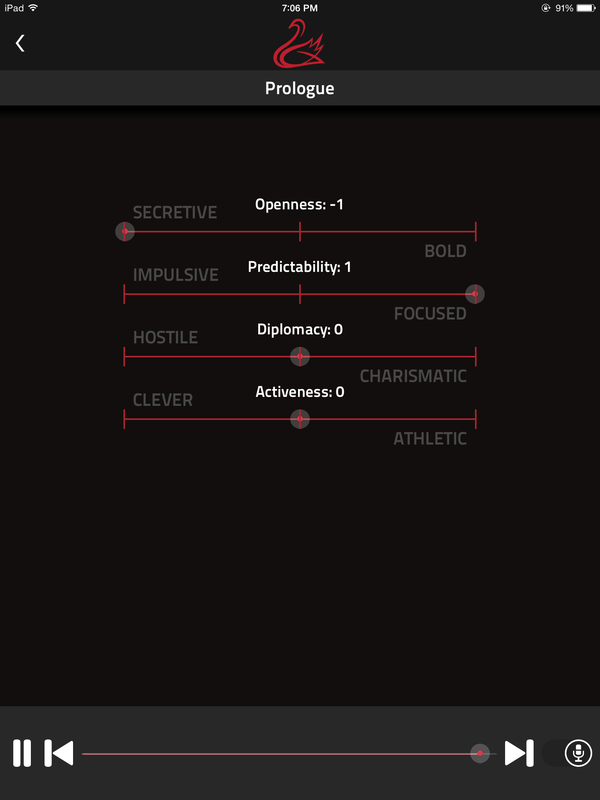 As with Choice of Games titles, your actions may determine character stats rather than causing immediate narrative branching; and in fact in Codename Cygnus a lot of your choices (“Athletic / Clever?” “Hostile / Charismatic?”) are explicitly asking which of your stats you want to use and enhance. Because you’re not viewing the text, the screen consists purely of a stats readout, plus controls to scrub or replay audio sections you’re currently listening to. It’s simple but attractive. I tried playing the game both ways — by speaking commands and by tapping them — and I found I liked giving spoken commands more than I expected to. It felt more involving than just tapping buttons, but not as cumbersome as trying to type on a mobile device. As with the IF Comp game Caroline that required you to type out one of several options, I felt a greater responsibility for the choices I was making because of the selection mechanism, even if I was still working from a small menu. While I’ve played several episodes, I haven’t exhausted all the content in the app, so I can’t speak for everything. However, during the portions I saw, the interactivity seemed to be primarily performative. You could choose one of two ways of doing a particular action (and I never encountered a three-way choice here), but either way, your decision would always work out and the plot would always roll forward along the same track. Occasionally there were some callbacks to your previous decisions, but that was mostly it, as far as I could tell. For some players the lack of diegetic agency would be a negative, but I found I didn’t mind: with the radio-play quality of the rest of the story, contributing within a predefined role felt about right; likewise, because it is all audio and has to be experienced in realtime, I think it would be cumbersome to do the kind of replay and node exploration one tends to do with gamebooks and some classic CYOA. This structure feels about right. Multi Path Audio: Books is a free app with stories implemented as in-app purchases — though currently only one story, “The Purple Island Glow-Grubs”, is available and it can be “purchased” for free. So there’s a monetization strategy in place here, but playing all the app’s available content will not currently cost you anything. Multi Path Audio is the least polished of these apps, in several dimensions. I appreciate that the audio is meant to be the point of this experience, but the interaction screen is ugly and confusing. The narrator is an enthusiastic reader, but moves a bit too fast sometimes. Meanwhile, the story begins with a rather long-winded set of explanations (read aloud) about how to change your game settings; once you’re past that, the prose is of the Enthusiastic Amateur variety cluttered with adjectives and adverbs. The plot wanders from incident to incident in a disorganized fashion that doesn’t come together (at least in my playthrough) into any particular arc, and the story features a comedy wizard named Devin who uses his spells to do dance moves and teen pranks. A key combat moment is punctuated by fart sounds. As with other examples, each piece of narration ends with an explicit choice (“Do you ‘attack’, or do you ‘stay here’?”) and you must speak the correct keyword (“Attack”) in order to proceed. Once or twice it had trouble parsing my input, but it mostly worked. So: this feels to me like a labor of enthusiasm, and they clearly put a bunch of effort into getting all the story passages recorded; and it looks like the basic functionality is there to do workable audio CYOA apps, if they got a) a UI designer and b) better writers. Right now, though, it’s way too clunky for the App Store context, and the story on offer is hard to recommend as a piece of interactive narrative. Mayday: Deep Space is an audio adventure that has you responding to a distress call from a damaged spaceship, guiding the caller through corridors still occupied by some kind of attacker. As in the IF classic Fail-Safe, any miscommunications between player and game can be blamed on a poor comms link; it’s easy to explain why the player has only a limited range of perceptions and options, too, because any information has to be relayed through this third party and the map data sent over by some sort of diagnostic system. Unlike Codename Cygnus or Multi Path Audio, Mayday is not designed to be played by someone sitting back with their hands off the device, however. There’s important information on-screen, and you have to hold down a button any time you want to use the communicator. You’re allowed to see a map of the ship, the position of the person who called you, and the positions of alien attackers; you command him with instructions like GO LEFT and RUN and STOP. Timing was a challenge for me at first, until I realized that voice commands are executed when as you stop holding down the communication button — so if you have a sticky thing you need to time, you can give the command, then release the button at just the right moment. There were some good aspects to this: at one point I managed to get my guy trapped in a hallway between two approaching monsters and I had no recourse other than to sit there and watch them triangulate on him while he yelped in terror into my earpiece. And there are rooms that aren’t strictly necessary destinations, but where you can learn a bit more story by making the other guy explore (though watch out for traps, obviously). On the other hand, the strictly-navigation gameplay means that this is quite a different experience from the others. It’s really not CYOA per se — there aren’t discrete decision points most of the time, and sometimes you’re just saying “Stop. Walk. Stop.” over and over. I also died (or, er, killed off my rescuee) and had to pop back to save points sometimes — a totally standard thing for a shooter level, but it made for some not really thrilling replay. I also didn’t see any way to play it without the audio-input aspect, which meant that I had fewer situations where I could play it than the other games. Still, the production values on this are very slick, and it’s its own kind of thing. See also: Home Sweetie-Bot Home (Jacques Frechet), a freeware parser IF game that accepts voice input. 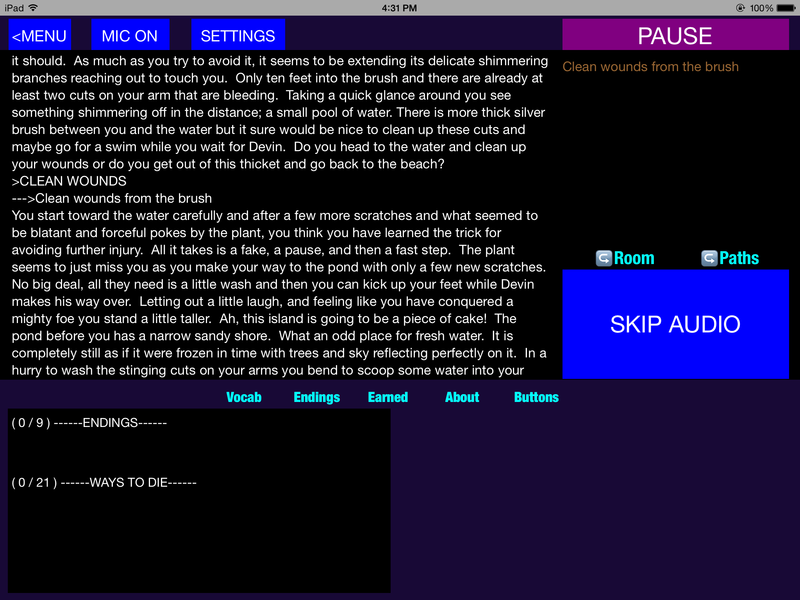 This entry was posted in audio, commercial IF, CYOA, interactive fiction, mobile platforms by Emily Short. Bookmark the permalink.